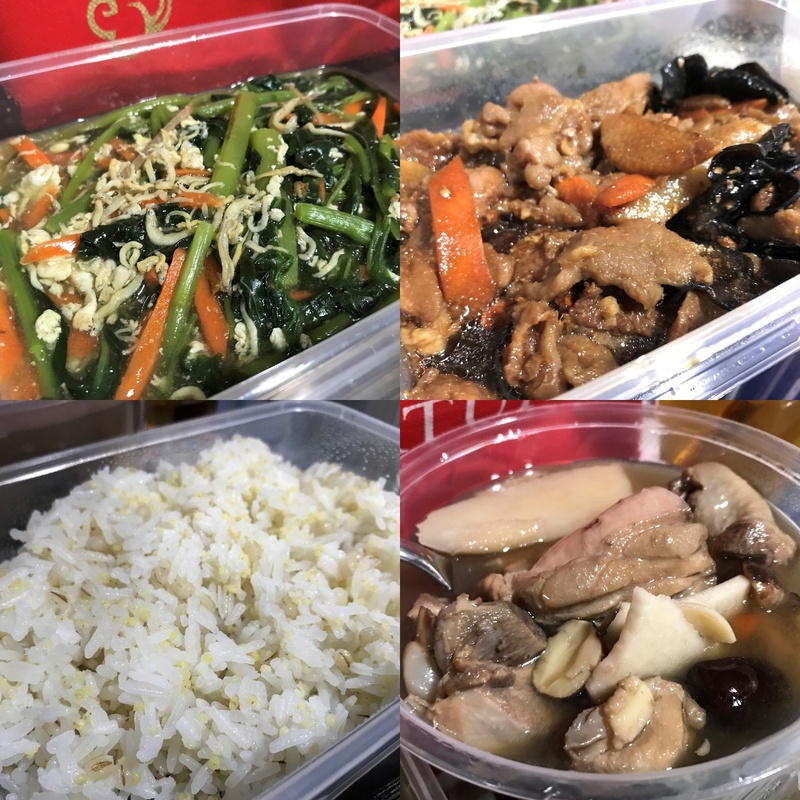 This post today is my review of the confinement meals which I had during my 28-Day confinement, catered by Tian Wei Signature. 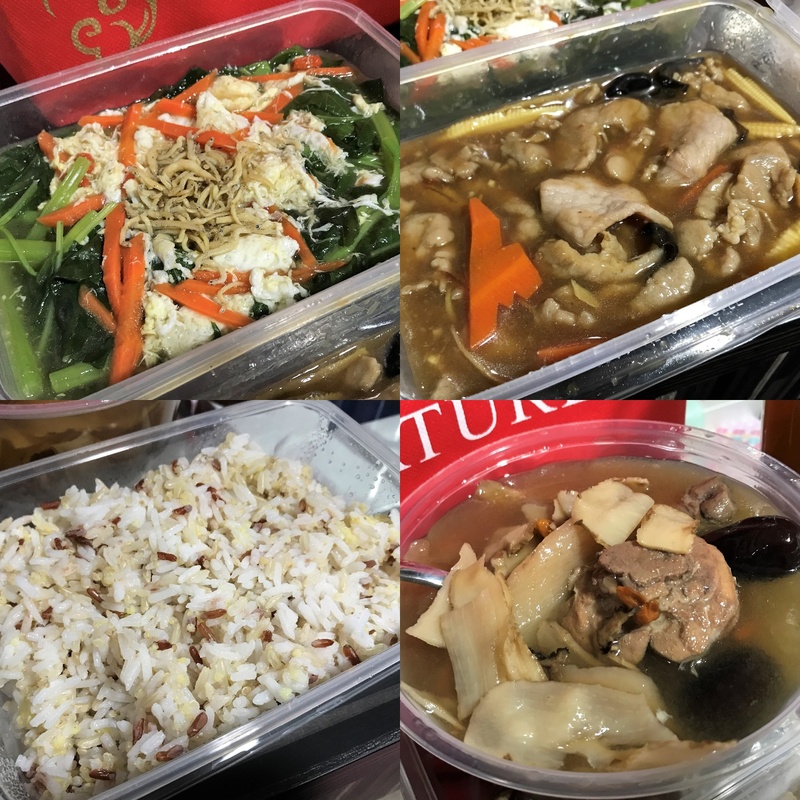 I will split my posts into two dividing the traditional meals and fusion meals since that is the way Tian Wei offers their 28-Day Double Package. 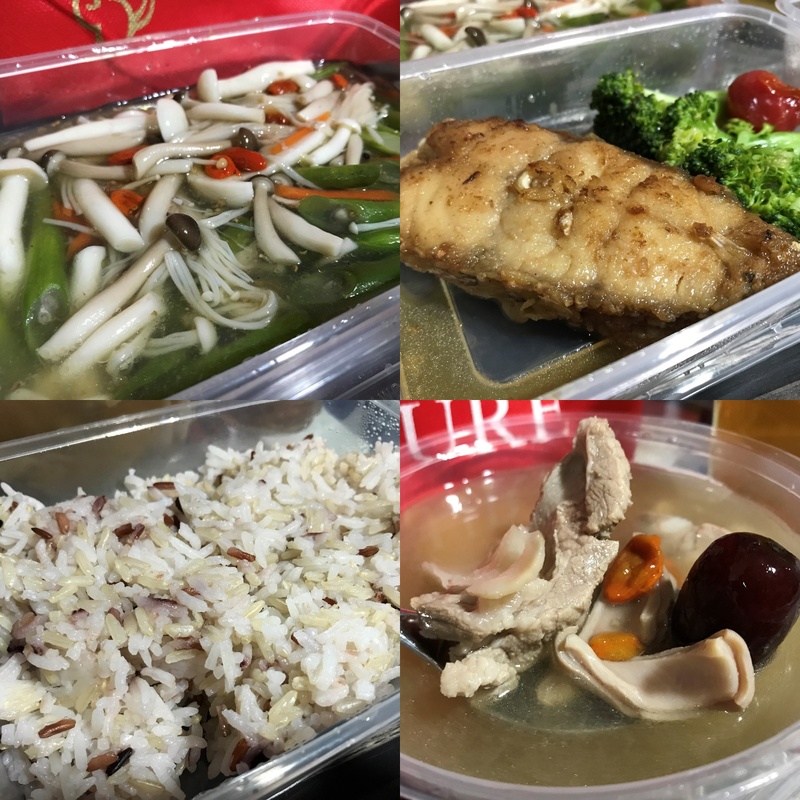 The traditional meals are served during the first two weeks of confinement followed by fusion meals covering the last two. 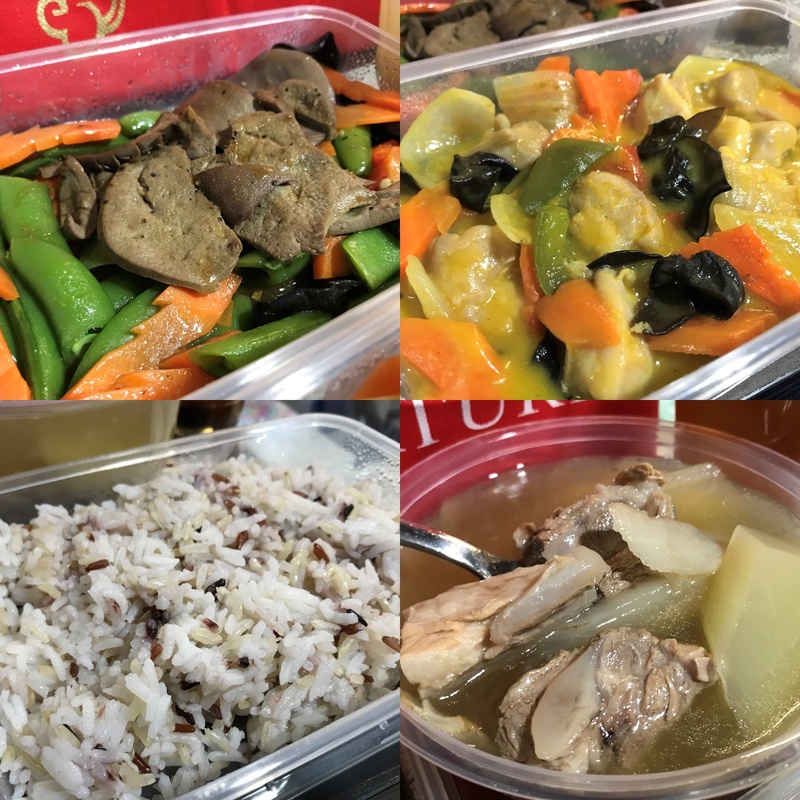 > Meals are delivered twice a day for lunch and dinner and always delivered early or on time. 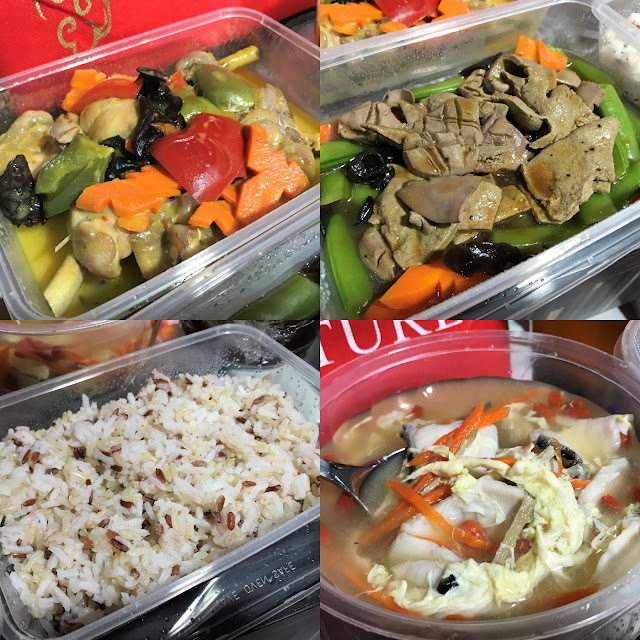 > Meals are delivered in a thermal bag and in plastic containers. Though not the most environmental friendly method, the convenience of not having to wash is a winner. > Food is always warm when I open up to eat, never had to heat up the meals but its an option for you to decide. > Every meal is balanced & fulfilling and comprises of 1 portion greens, 1 portion fish/meat (fish/chicken/pork), 1 portion of staple (rice/noodles), and a portion of either soup or dessert. Not forgetting a liter of Red Date tea which is packed in 2 separate plastic cups. > On the first two days a portion of 'Sheng Hua Soup' （生化汤）is given on top of the normal dinner meals which serves the purpose of helping postpartum uterine contractions (see next segment for more details). > Portion is quite generous but not extremely much that I couldn't finish. I could finish every single dish and about half the rice on every meal. I don't know if I'm really such a big eater now or that breastfeeding hunger is real!! LOL! Anyway breastfeeding Moms really need to eat well to keep our supply going, so no dieting! And you'd need to eat well to recuperate well to take care of your baby later. So just eat k.. get yourselves well and ready before thinking of dieting. 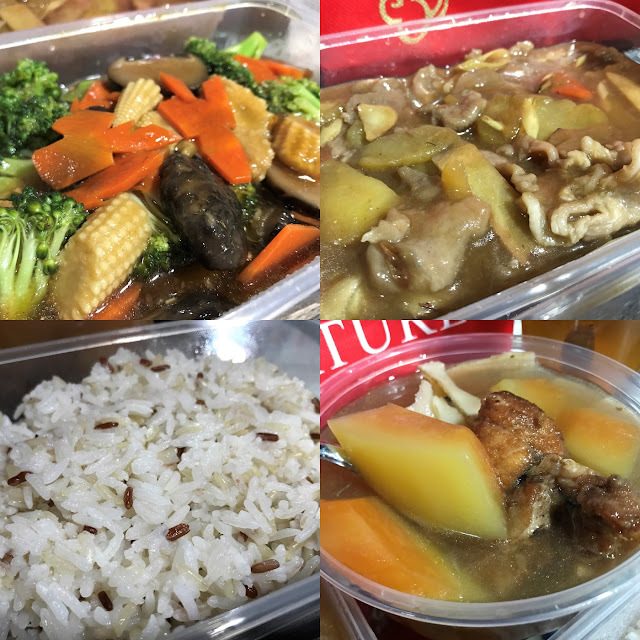 Let's take a look at the meals & dishes as I comment on them. 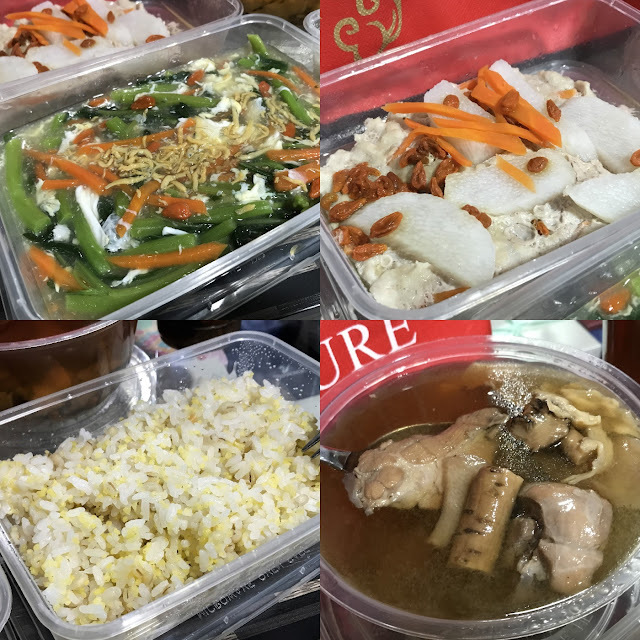 Sheng Hua Soup （生化汤）: Most important decoction that helps postpartum uterine contractions. The main role of it is to increase blood and promote blood circulations during postpartum, promotes secretion of milks, helps on painful uterine contractions, lochia discharge, and to prevent blood clots. As I was discharged on a Saturday, my first meal was the Saturday lunch.. 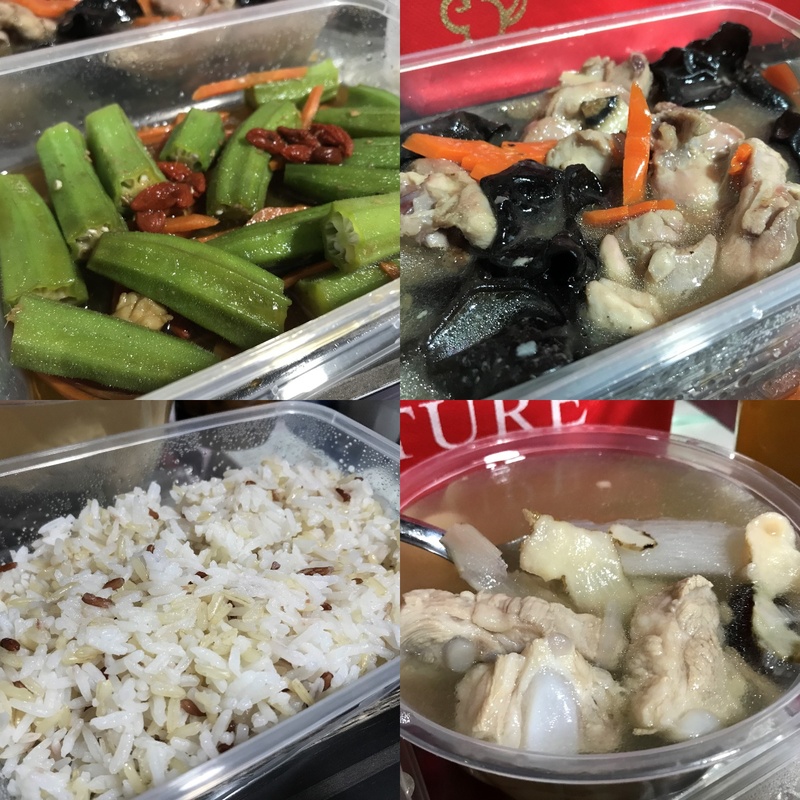 I've put up the menu of the day as well as the purpose of the Sheng Hua Soup above. 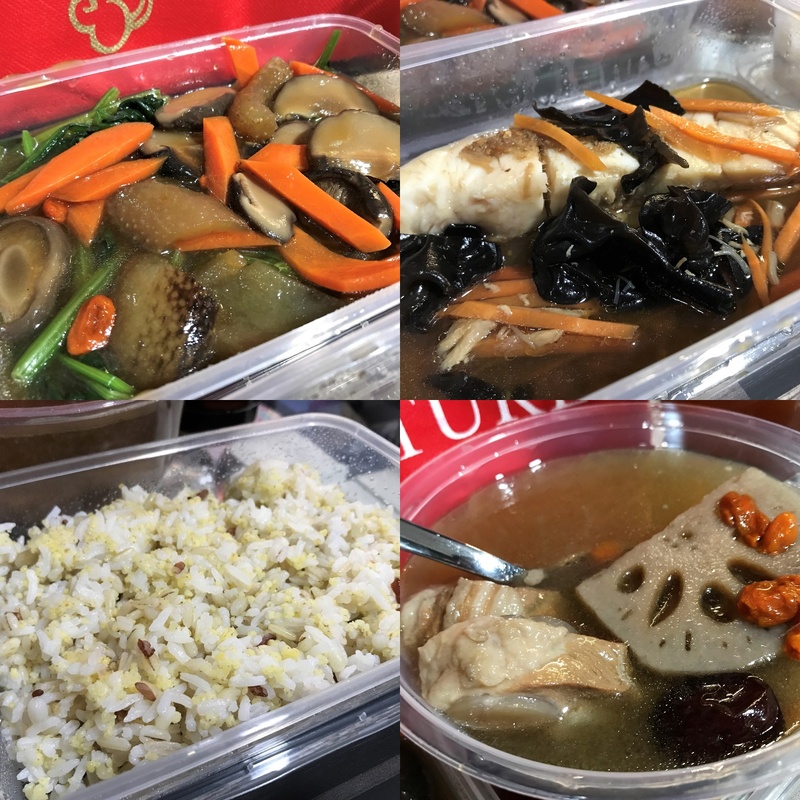 I realised I forgot to snap a pic of the Sheng Hua Soup - it's basically just a plain bowl of dark-coloured looking herbal soup. To find out more about it, click on link here. As much as this soup is bitter (to be honest), it is good for you and your recovery so please drink up. Just take it as a herbal drink and bottoms up. So I have my meals at my dresser every day, my dresser is actually an attachment of my room. Both my confinements are quite similar in this sense. Now its just like having room service with my meals catered - receive delivery, eat and throw. Hassle free and simple. Hehe. 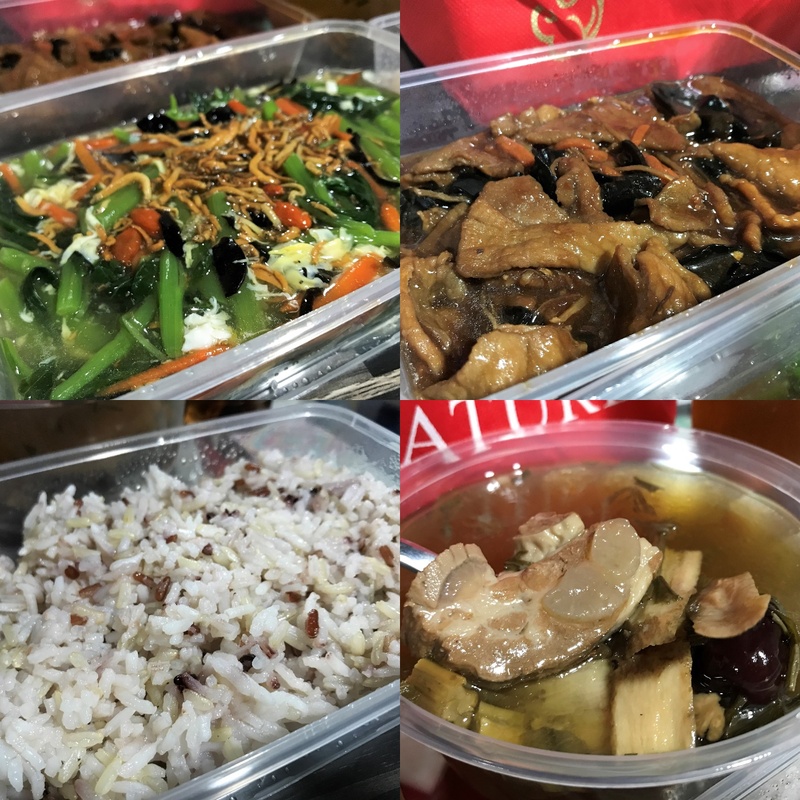 Things I like about the flavors of the dishes, they are not oily at all and not too salty. And definitely a yes-yes for no MSG added! If you're wondering how come the menu says 'white rice' but you see something else, it's b'cuz I've requested for a swap since I'm not a fan. 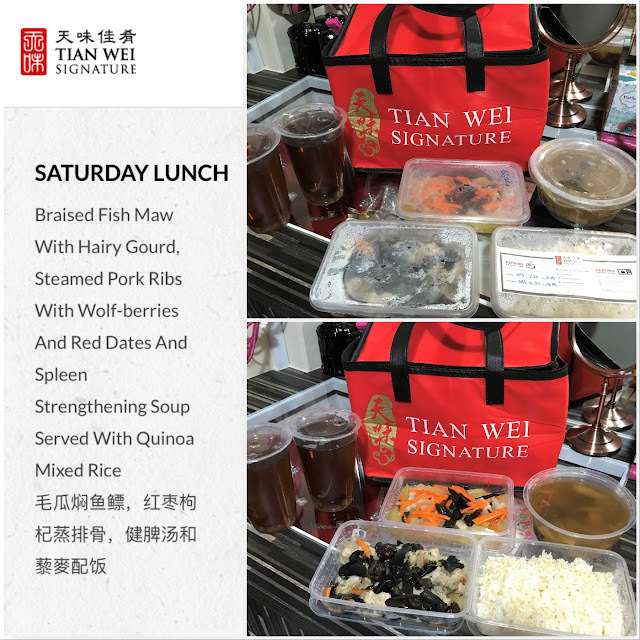 You may state your preference and the team from Tian Wei will assist on your request if possible. Dispel Blood Herbal Tonic Soup: Stimulate Circulation to end blood stasis, tonify liver and kidney, strengthens the muscles and bones, and the capability of removing rheumatism. 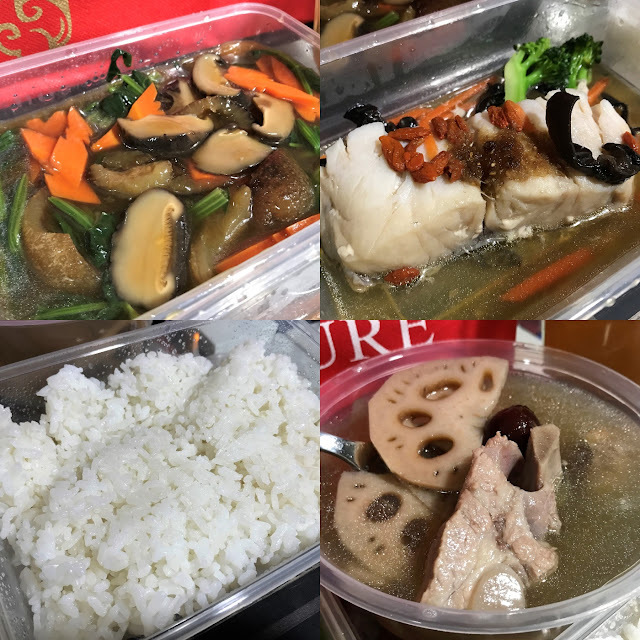 The tonic soup-of-the-day is served during lunch and each of the soups have their own purpose in aiding with your recovery. 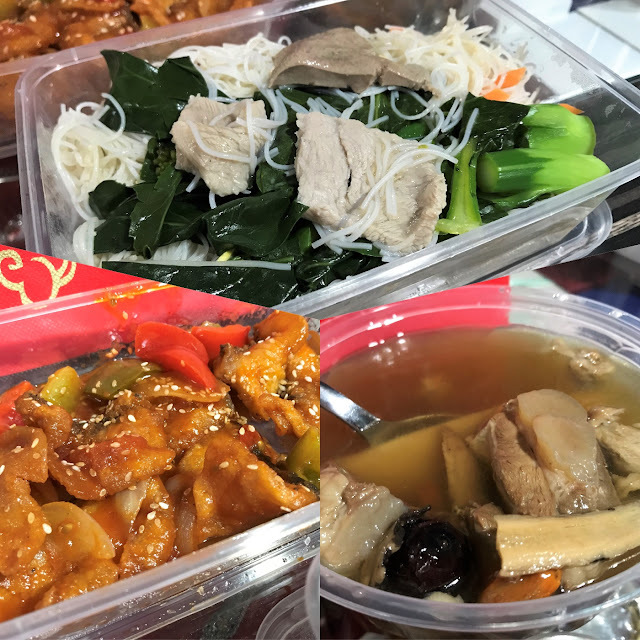 There are 30 types of herbal soups in Tian Wei's menu, so much to try! This was one of my favorite meals. 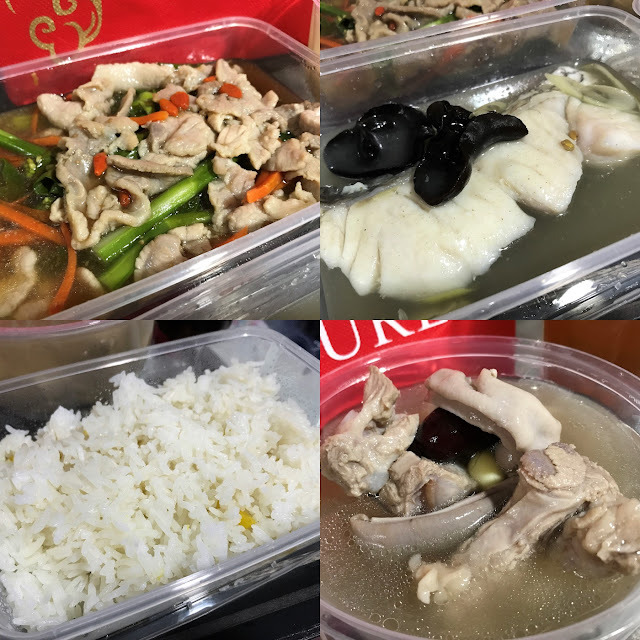 I love the Slice Fish w Egg Ginger Broth (Soup) b'cuz it's really flavorsome and different from the usual chicken or pork ribs soup. 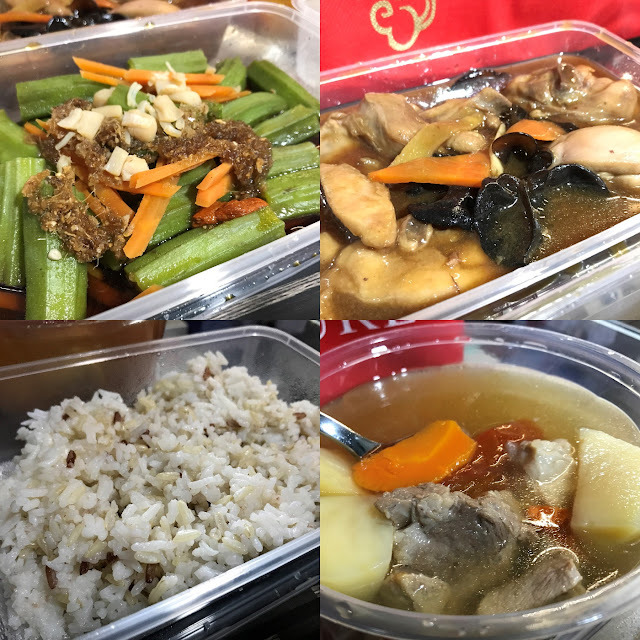 Also love the pumpkin sauce from the Chicken w Capsicum in Pumpkin Sauce dish 'cuz it taste a little different from the usual Chinese food. Reminds me a little of Pumpkin Soup, hehe. 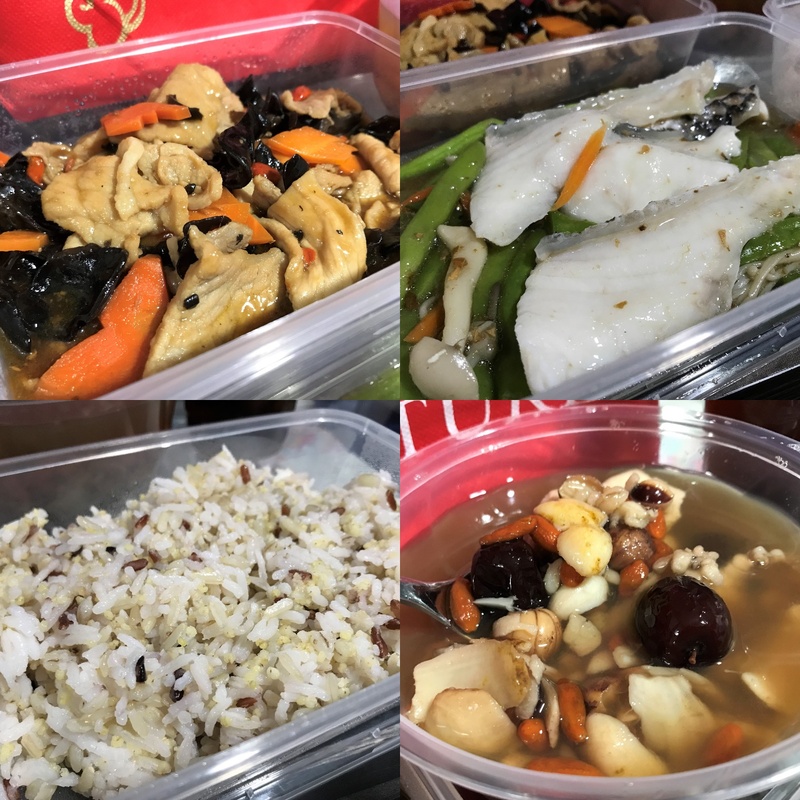 Threadfin: helps to promote breast milk production, ginger to dispel wind and black fungus nourishes the lungs, stomach and liver. 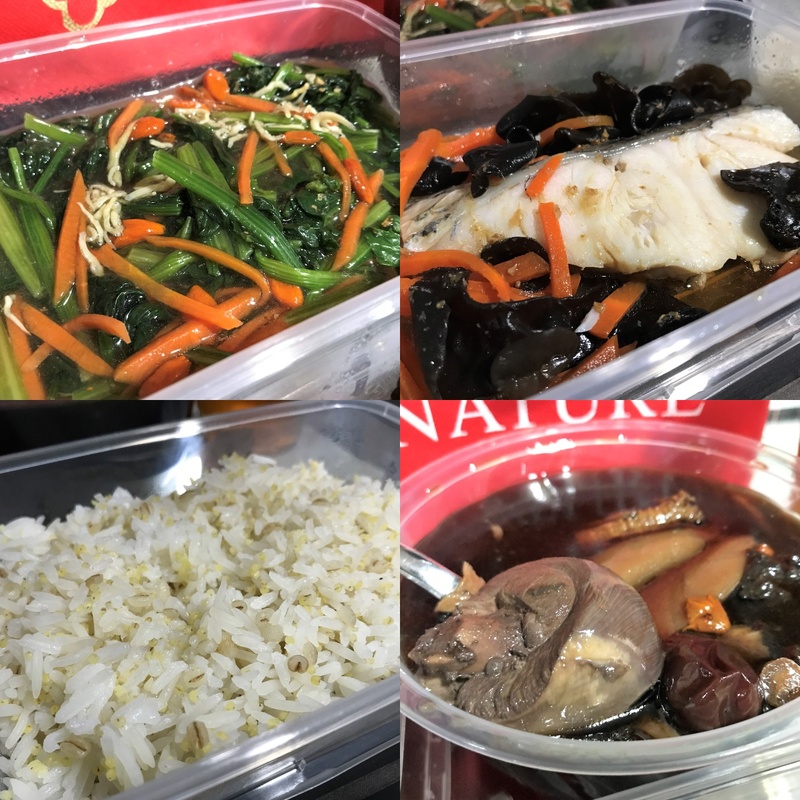 I usually buy Threadfin and Cod fillet for Baby F. to make porridge or steamed with rice, first time I'm having it for myself. It's quite nice especially knowing its a milk booster. Lemongrass: helps to relief cold symptom from the body, combat fatigue and anxiety. Galangal contain anti-inflammatory properties, relief discomfort caused by inflammation of the abdomen and blood circulation. I am usually not a very big fan of rice and do not eat it if unnecessary. I think the only time I really eat alot of rice is during confinement b'cuz I have to boost my calorie intake, and also the meal wouldn't feel complete without it b'cuz the gravy from the dishes go very well with rice. It's b'cuz of the gravy that made me be able to have at least half the portion of rice. So that being said, most of their dishes are cooked with quite alot of gravy. If you're not a fan of gravy, I'm sure you could send your request and the kitchen will make adjustments based on your preference. Fenugreek is a milk booster which I was definitely excited to try. It didn't have any strong taste to it and in fact I couldn't really identity the taste.. But if you see from the picture above, its the little seed-like bits on the fish fillet. 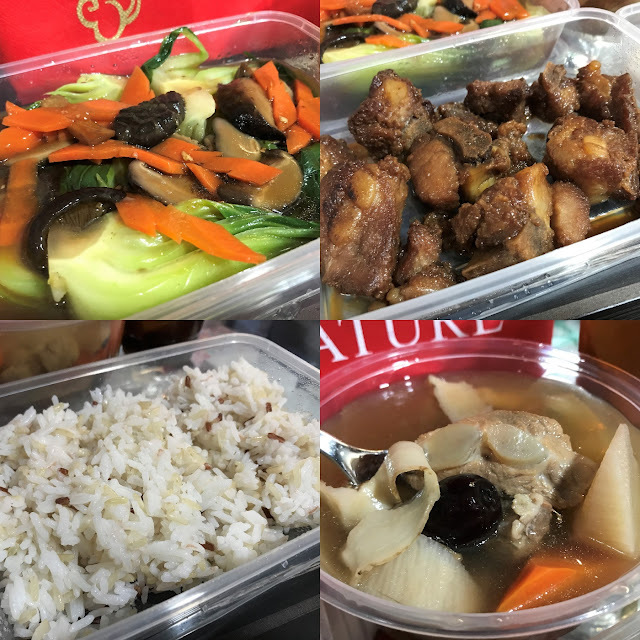 Pig kidney: helps ‘replenish’ the kidneys, especially for confinement mothers who suffer from back pain. Green Papaya Fish Soup: Detoxifying and increase breastmilk, cure deficiency, reduce diuresis and swell. 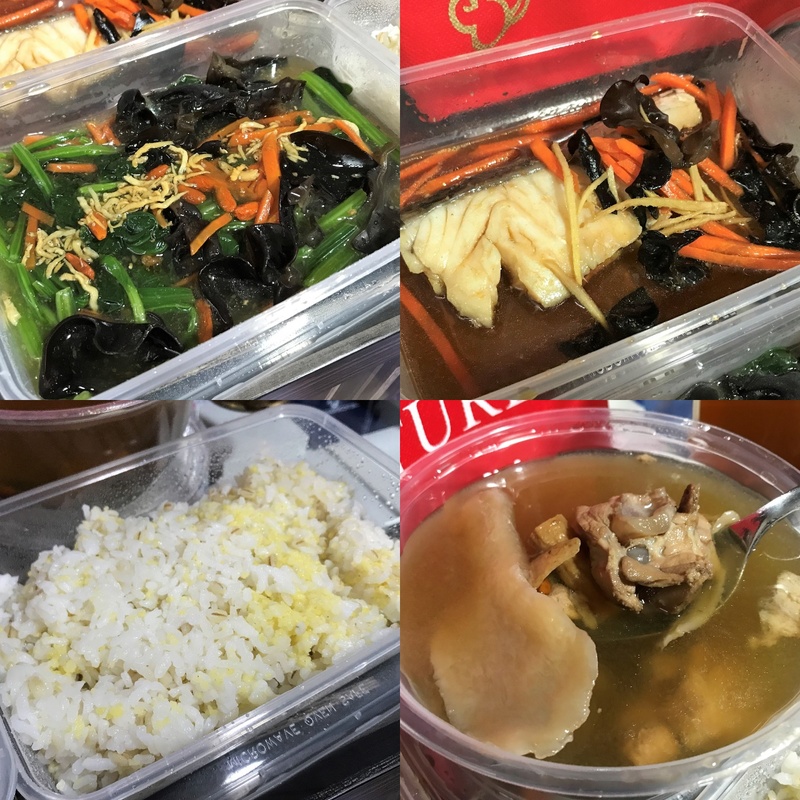 The soup is light even though fried fish is used. 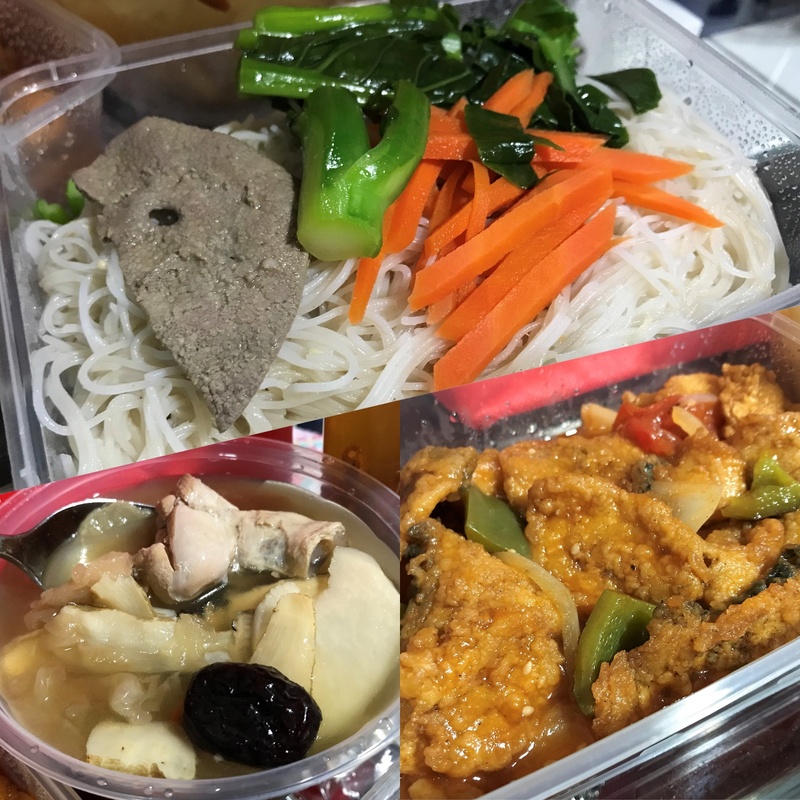 Polygonum Multiflorum Black Chicken Soup: Nourishing the blood, increase black hair, tonify liver and kidney, and the capability of anti-aging. I really didn't know what Polygonum Multiflorum was until I had this soup and Googled it (link here). Still half clueless what it is but the soup is to my liking. I'm a huge fan of anything beans so really fancied the beans in the soup. And just a mention on the Red Date Tea, they're thoughtfully provided in two standard sized cups (total 1L each meal). I usually have one with my meal and kept the other for later the afternoon. There were Longan and Red Date pieces inside the drink, but was a tad sweet/thick for my liking. 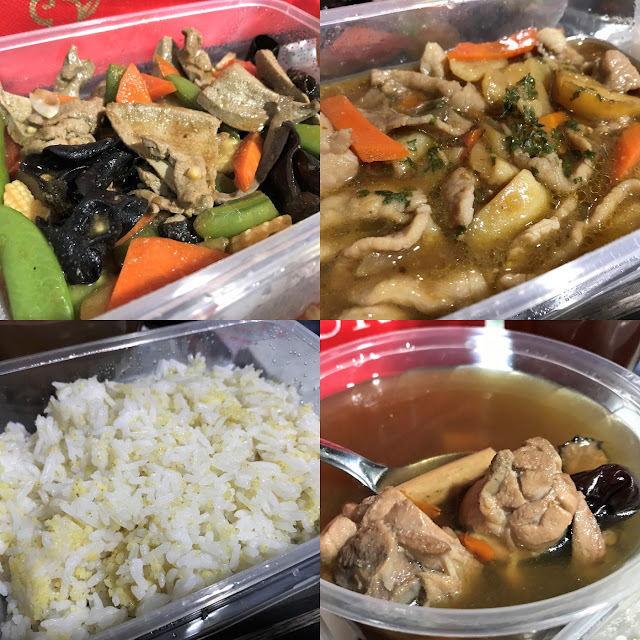 I called up Tian Wei to request for a less sweet version and was immediately changed to my preference on the next meal. Kailan: is rich in iron and is believed to strengthen joints and lymph, and is beneficial to veins and bones. Pig Liver is reputed to possess yang essence and has high iron content. It helps to replenish blood, especially if confinement mother is suffering anemic after childbirth. This was another of my favorite meals surprisingly. Surprisingly b'cuz I'm usually not a fan of Bee Hoon. When I first saw it on the online menu I thought like bleah. But when I tried it, to my surprise it was rather addictive. I like the moist texture of the stir fried Bee Hoon plus the pairing of my favorite dish, Sweet & Sour Fish Slices.. Yums! Braised Chicken With Black Fungus And Angelica: This dish benefits and balances the blood, it build up our body supplements due to loss of blood, treats pain and soothes the intestines. 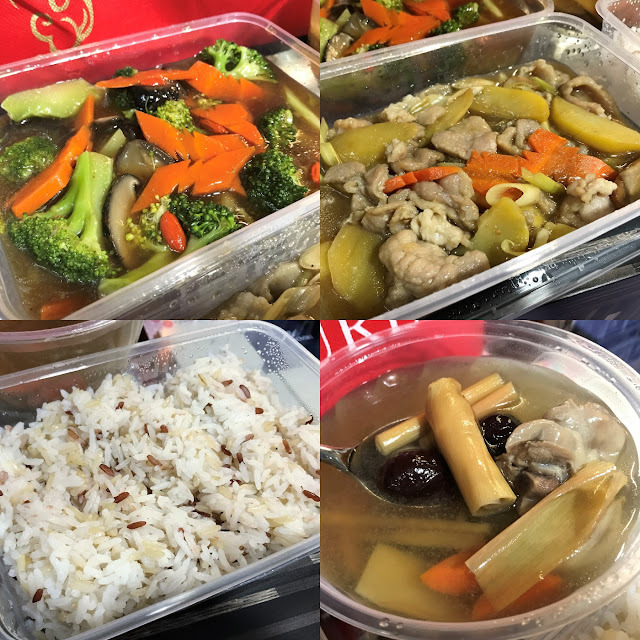 I am usually not a fan of pork and chicken meat, but I don't know why the Steamed Pork Ribs w Wolfberries and Red Dates are totally my thing. The gravy is just yums it made me eat alot of rice! LOL! 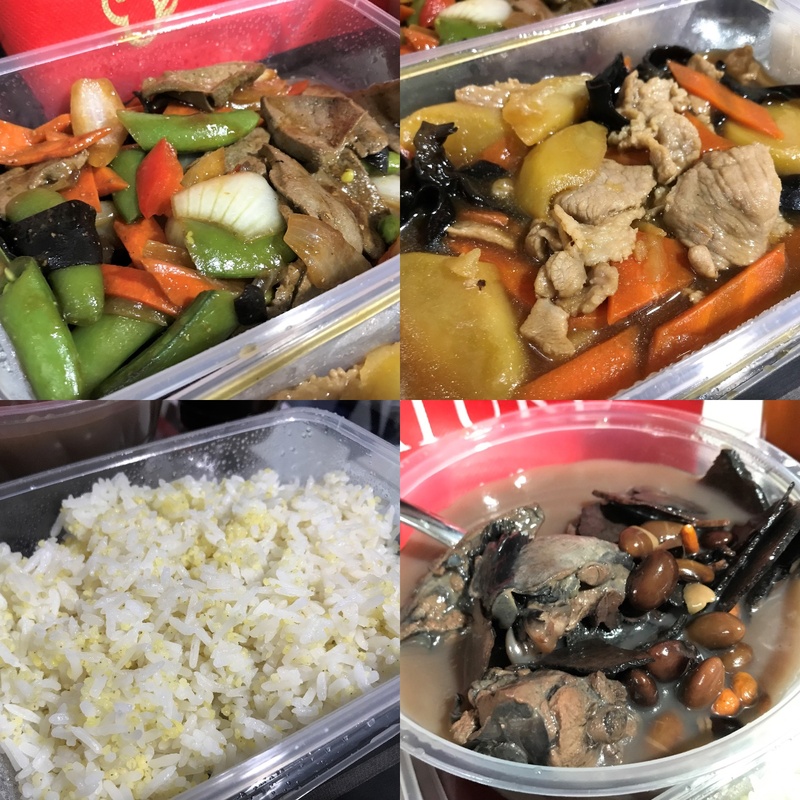 If you do start to feel like you're seeing repeats, the menu repeats itself once for each 2 weeks meaning once for the set of traditional.meals and once for fusion meals. Not repeated exactly the same but a change in the soup paired with. So the most you're gonna have the same dishes are only once and after 7 days. To me it is already considered a very good variety of dishes since usually what confinement nannies cook are typically the same almost everyday. So this is a luxury! The pork dish and its gravy, again super good with rice. Yummeh! The Five Grain Rice was my favourite type of rice dish overall. 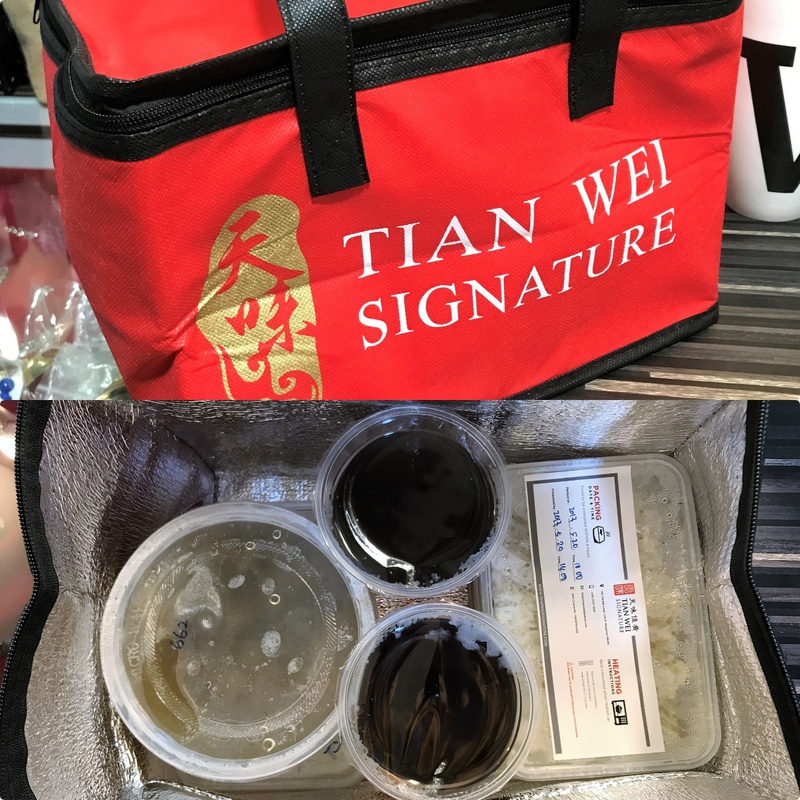 At Tian Wei Signature, there's 8 types of rice in their menu so you won't get bored of the same thing everyday. 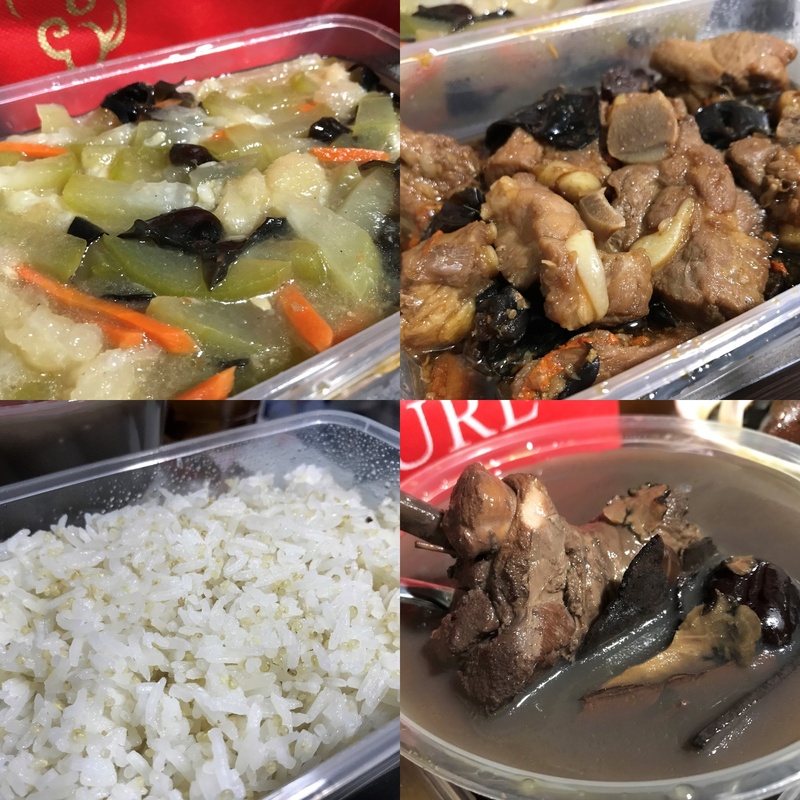 Blood Nourishing Soup: Nourishing and increase “Qi”, spleen and stomach, replenishing vital essence and beauty, enrich blood and nourishing the blood. 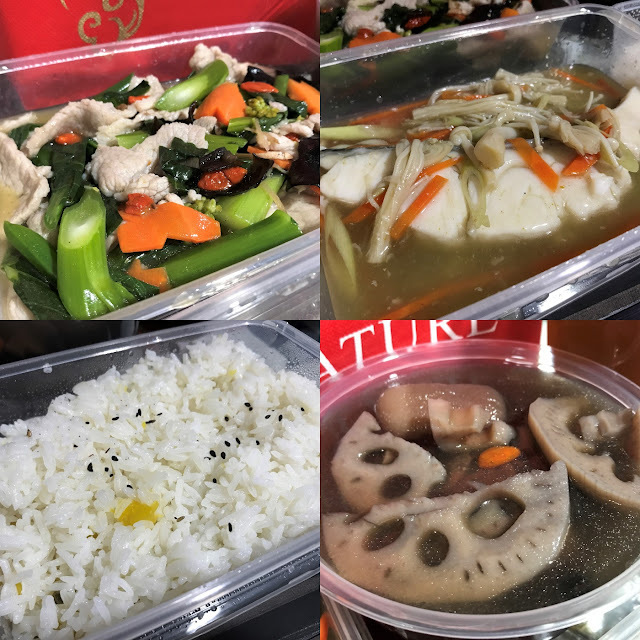 Steamed Okra With Conpoy: Okras or Lady Fingers contain high amount of Beta Carotene which helps in improving eyesight and Vitamin C, A and K, which are all the properties that help rejuvenate mothers during confinement period. > Wide variety of dishes. > Food contains no MSG, low in fat, and well balanced meals. > Kitchen is flexible to adjust flavors to Mummy's preference. 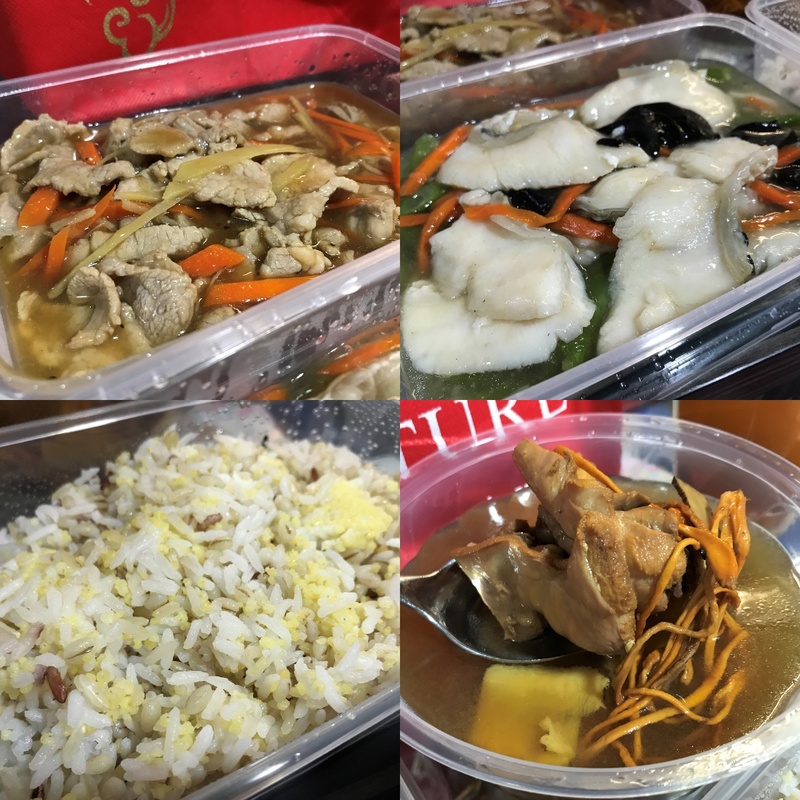 > Interesting mixture of traditional and fusion meals. > Menu includes more than 12 breastfeeding-friendly ingredients to help boost milk supply for breastfeeding Moms. > Entire confinement meals thoughtfully planned out for every Mom's recovery. 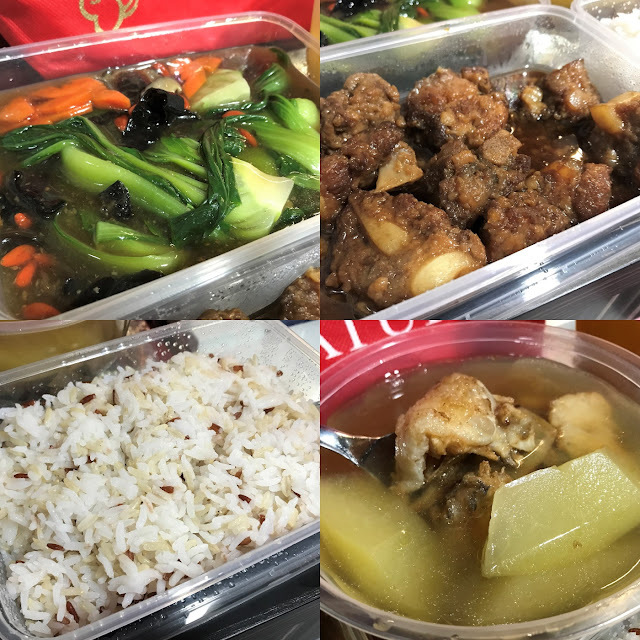 > Hassle-free dining with disposable containers. > Fresh and warm food every time as meals are delivered in thermal bags. > Meals always arrive on time. > Staff are friendly when delivering food, office team are fast & efficient in responding to emails. 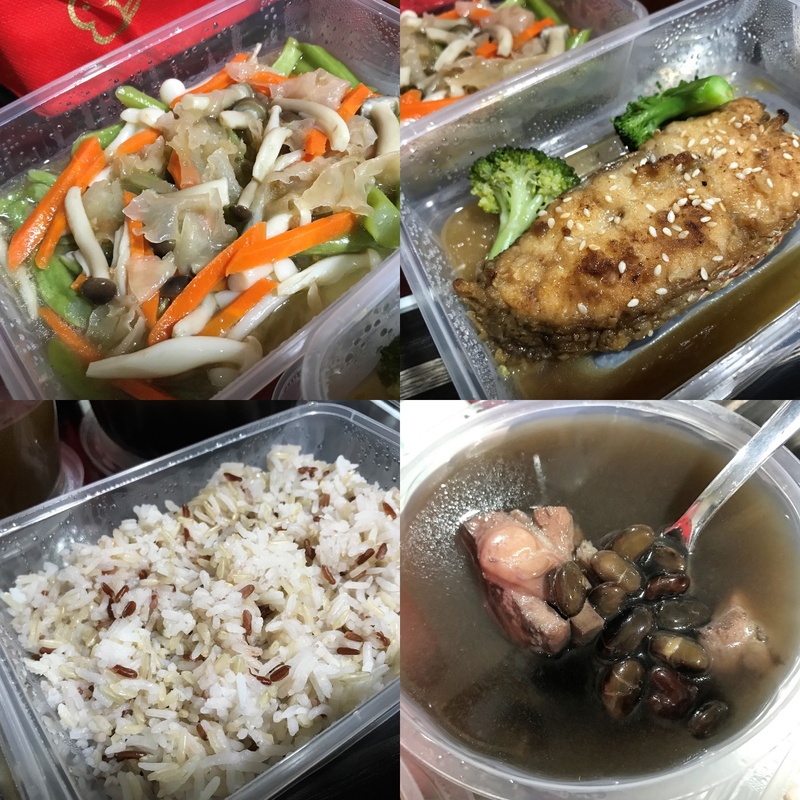 Was there anything I disliked about Tian Wei and their confinement meals? No wor.. I really have nothing to complain about. Hehe. So far everything has been great.. Now Im just looking forward to trying the new set of menu; the Fusion Confinement menu!! B'cuz I've never tried anything else other than the traditional stuff. Due to over whelming response of the promo code provided, Tian Wei Signature would like to extend the promo code provided up till the 30th June 2018. Hurry don't miss this offer!! The cake is one of the most traditional parts of any child's birthday. Butter cream frosting and cheerful colors can turn simple baked comfort food into treats worthy of a celebration. If you want to surprise your kids, learn how to make cookie balloons, candied lemons, and edible roses. Treatment of Lower Back Pain with Ayurveda - This is a very continuous type of problem and is characterised with sharp or dull CBD oil for back pain in the lower back region. A blow or major fall can also tear or sprain tissues around spinal cord region which may cause severe back pain and neck pain. Food and beverage industry in truth is nothing baked recipes a collection of reasonable disparate albeit interconnected categories of food components. Dairy milk and bakery products are integral part of the food industry despite looking distinct in features. Just a Mama who loves writing and sharing real-life experiences thru my page & blog. Also on a mission to inspire women that even Mummies can continue to lead a healthy & fit lifestyle whilst looking great both inside & out. XoXo; Vanny.